In September, Craig Thompson came to the Twin-Cities to speak at MCAD (The Minneapolis College of Art and Design). His newest work, HABIBI, had just been published, and many of us had long been anticipating his follow-up book to BLANKETS. To say this was a magical lecture would be an understatement. I’m still reeling from this book event – even two months after the fact. I know I’m not alone here. This experience was so awesome, that I felt it would behest me share some of my notes regarding Craig’s thoughts on being a writer (& the overall experience), magic squares and easter eggs. Yes, easter eggs. Craig Thompson emphasized how Comic Art can be the best of both worlds – writing stories and creating illustrations. He reminded us that either would be a singular challenge; and that doing both would be doubly difficult. Observing Craig’s process on how HABIBI came together was amazing. He implemented calligraphy throughout the book, going as far to state it was “music for the eyes.” So much that comics can be the figurative sheet music when one adds this special touch. I especially appreciated his commentary of pen vs. pencil during the illustration process. He seems to prefer pen & ink, as it will “confirm” the words and images in one’s book, i.e. keeping the “mark” that’s been made. Irrevocably this process will take a writer one step closer to finishing a work in progress. Thereby, allowing the book (and art) to take a life of its own. As one’s work-in-progress evolves, the next challenge is maintaining one’s personal life, of which Craig deftly handled that topic. Being a person who gets to work with writers, it astounds me that ANY writer is able to accomplish such a fine balance. From my point of view, creating a book (which is very private process) and maintaining life’s daily challenges amid the interruptions is an incredible feat. 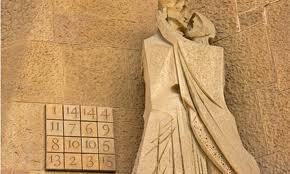 One of the tools in ensuring this success was the use of magic squares, otherwise known as mathematical narratives. Showing the audience a 3×3 square, Craig stated this was how he laid out the laid out HABIBI’s storyline. At that point, the crowd even seemed to do a breath intake. Have you ever attended a book lecture where the world seems to open up – and an entirely new perspective is imprinted on the brain? If not, I hope that day arrives for anyone who is reading this post. My moment happened of clarification happened at Craig’s lecture; for many others in attendance, they stated the same thing. Yet again confirmation of the how incredible a writer Craig Thompson is; plus a piece of wisdom every writer should aspire to. What is the “Easter Egg” in a book? It is a special hidden element that some readers will recognize and connect with on a hidden level. Maybe it’s a particular plot, character, theme, etc. The end result is the narrative reaching the reader at an entirely unexpected new level; becoming a catalyst in regard to one’s life decisions, reading habits, creativity and more. Since I’m going to put everyone on the spot about this concept, it’s important that I mention my Easter Egg experience, which happened at the age of 14. The book was THE AWAKENING. It forever changed my outlook on adulthood, on major life decisions, on what one wants (or doesn’t want), and on the effects of societal influences. THE AWAKENING represented another important thing too; that the talented author, Kate Chopin, probably never imagined she’d polarize readers with her only published book– let alone never write another novel again. I could ramble incessantly about this book, and how it forever changed her life – and my own. Instead, I now realize it was my “Easter Egg” moment as a reader. My question for you. . .
For readers: What are your Easter Egg moments with books? Did it happen in early childhood, or did it happen with maturity (as a reader, as a person). What was that book? What insights did you gain from it? Did others feel the same way? For writers: Have you been able to connect to readers at such a level? Is your creative work reflective of only YOUR experience(s), or is there a universal appeal to readers? I’m going to close out for now, as once again I have magic squares and easter eggs on the brain. What are your Easter Egg moments? And for anyone who has seen Craig Thompson speak, what was your experience like?